There are a lot of predators online today, and maybe you are concerned with whom your children are chatting. Perhaps you are afraid that your spouse is having an affair. Whatever the case, a good way to keep tabs on what your family is up to is by checking on their instant-messenger conversations. It’s not hard with the right software. Find an instant-messenger chat tracking software. Three to consider are Spector Pro, WebWatcherNow and Surveilstar Monitoring Software. Download the software from the website where you purchased it and double-click on the file to install it. If you received the software as a CD, simply insert it into your computer’s CD/DVD drive and follow the installation instructions. Once it is installed the program will record any instant-messenger conversation automatically. Open the program by going to the Start menu and selecting it. Go to “File” and select “Chat/IM Recording.” This opens up all of the recent chat conversations that have occurred on that computer. It will have the complete conversation, a time stamp, and the user name of the person involved. To prevent data leakage via IM file transfer, and stop employees from abusing Chat and Instant Messaging, you can block chosen users from using IM applications, and block IM file transfer. 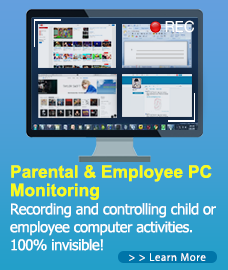 SurveilStar Instant Message Monitoring feature logs all chats in the popular instant messengers such as QQ, ICQ, MSN Messenger, YAHOO, TM, UC, POPO, SKYPE, RTX, LSC, ALI, FETION, and Google Talk. Besides, it can filter, block and backup all outgoing file sent via the above Instant Messengers. A 30-day free trial version of this professional IM chats monitoring software is available. Feel free to download and try. How to Establish IM Monitoring Policy? IM File Transfer Policy is used to monitor and control all outgoing files through Instant Messenger applications. Whether it’s MSN, Skype, Yahoo! Messenger or ICQ, SurveilStar can block suspicious file transfer via any of these IM tools, by file name, file size, or file extension. For instance, you can tell SurveilStar to filter a document named “Q2 Financial Report” and block it from being transferred via IM. Or you can tell SurveilStar to filter all Microsoft Document files, which are with the file extension of .doc, and block all attempts to transfer any .doc file via IM. Here we are going to show you how easy to set an IM file policy to block outgoing file throught MSN using SurveilStar Console. Login SurveilStar Console, select the target computer (group) that you want to apply the policy. Navigate to Advanced Policy > IM File. Click button to add a new IM file policy. Go to the Property panel. Enter policy name. Select Block mode. Check both Alert and Warning options. Enter the warning messages. Input file name (support wildcard input, using ; or , as separators). Check Backup property to save all outgoing files. Click button to save and apply IM blocking policy settings. When the monitored user is going to send file out via Instant Messengers like MSN, ICQ, YAHOO! Messenger, Skype, Lotus Sametime, SINA UC, QQ, TM, RTX, POPO, etc., SurveilStar agent will block the specific email immediately and send user the warning message at the same time. The Alert notification will also pop up if SurveilStar Console is running. How to Retrieve the IM Outgoing Backup File? Whether it’s ICQ, Yahoo! Messenger, MSN Messenger, AIM, Skype, Lotus Sametime, or Tencent QQ, SurveilStar automatically records and saves the chat conversations and instant messages for your later review. The recorded IM contents can be saved in .htm or .html format. Supervisor can search IM records with specified keywords. The Instant Message log includes: IM applications, computer name, user name, contact person, begin time, end time, and the contents of Instant Messages. 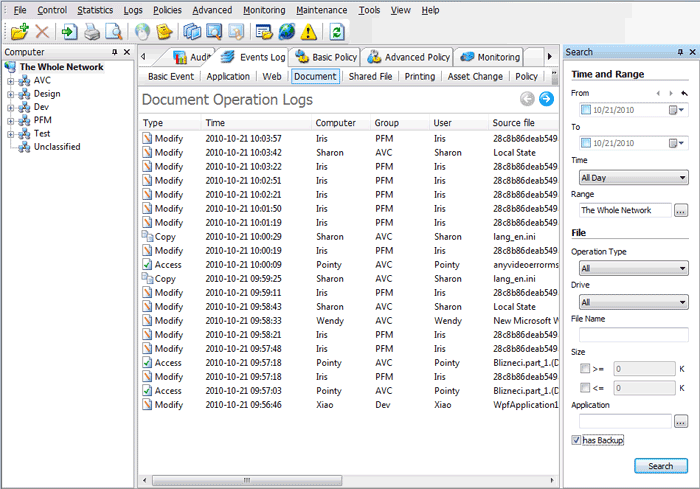 Navigate to Log > Documents. Go to the Search panel, check “has Backup” option, and then click Search button to start searching outgoing IM files. Double click on any of the records to view the instant backup file properties. How to Monitor IM Chat Contents? The instant messages are recorded according to tools, computer, local user, contact user, beginning time, ending time and statements. You can specify search term to find desired instant messages to read. Navigate to Monitoring > Instant Message. Click on any reorded instanst message to review the details. Go to the Search panel, define time and range, or instant message tool (All, QQ, ICQ, MSN Messenger, YAHOO, TM, UC, POPO, SKYPE, RTX, LSC, ALI, FETION, Google Talk), UserID or Nickname, or content to search specific im message. How to monitor screen snapshots? How to monitor instant messages? How to monitor website visits? How to monitor document operation? How to monitor skype usage? This entry was posted in Instant Message Monitoring, SurveilStar Employee Monitoring, Surveilstar Features and tagged backup transferred files, block im, Chat & Instant Message, how to monitor im, How to track instant message, How to Track Instant Messenger, IM monitoring, instant messenger monitor, Monitor Instant Messaging, monitor instant messenger. Bookmark the permalink.